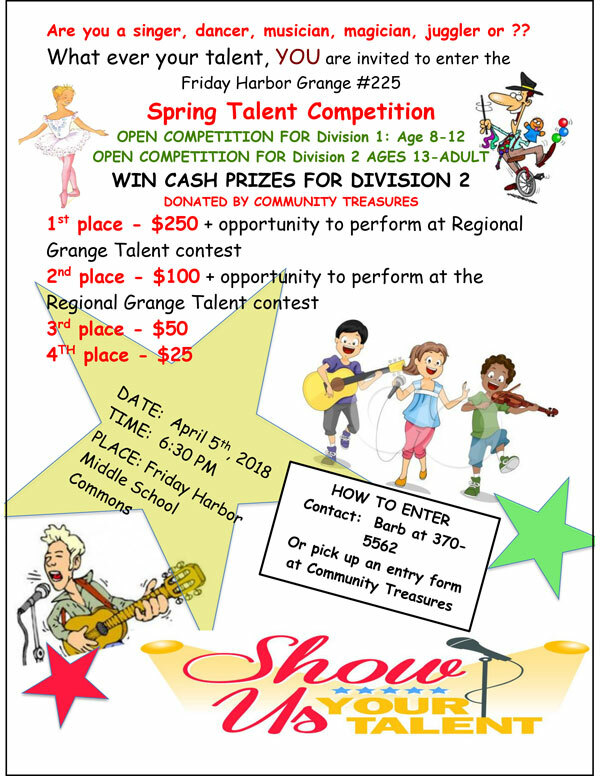 Do you have a talent you want to practice in public, and maybe win a prize? 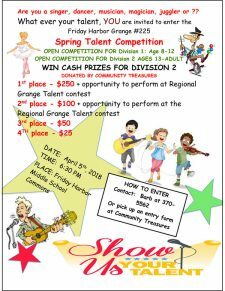 Friday Harbor Grange #225 and Community Treasures are sponsoring a Talent contest at the Friday Harbor Middle School on April 5th at 6:30 pm. There are 3 categories: Vocal, Instrumental, Variety – Performers using skill, timing, grace, dexterity of body movement etc. These “novelty” acts would include: dancing, skits, monologs, reading, comedy, etc. Division 2 winners have an opportunity to move on to State and National competitions. This contest is open to all ages and anyone who wants to have a good time and share or practice his/her talent. Taped accompaniment for vocal acts may include background voices, but it must be background voices only. No voices allowed on taped accompaniment for instrumental acts. All costumes should be considered appropriate for the type of act being presented. There is a one-minute minimum time limit. The maximum time limit is six minutes. Two points per minute, or portion thereof, will be deducted from the total points for performances going over time. In acts consisting of more than one performer, all performers must submit an Entry Form, and no substitutions may be made at the contest. The act may be performed with fewer participants, but may not add or replace. Accompanists are not judged; therefore, accompanists may change. Any contestant displaying inappropriate behavior before or during the contests may be disqualified. If you have further questions, please email ctrecycling2@gmail.com, or phone 360-317-5130.